FESTEN is a project created by director and co-producer Alain Leempoel. 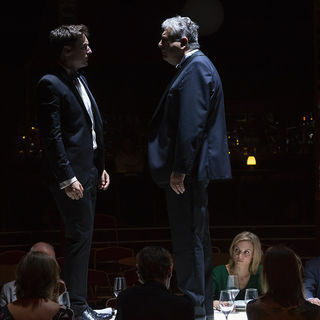 It was a specific experience that brought 22 actors together on stage every evening, plus technicians and 9,000 spectators who took part in this meta-theatre over the month. FESTEN is now 20! In 1998 there was a film, in 2003 a theatre adaptation and in 2018 a stage production in Brussels. In September, FESTEN created a giant wooden tent at the Boitsfort Hippodrome, newly renamed DROH!ME! They chose DROH!ME because they wanted to be part of the redevelopment of the site, which had remained an abandoned part of our heritage for too long. The inside of the tent was turned into a dining hall ready to welcome guests for dinner in the heart of the FESTEN family intrigue. Wherever visitors sat, the staging and scenography offered an extraordinary theatre experience with a high degree of proximity between actors and spectators, with the latter seated in a circle around the action. Spectators could book their place at the table for dinner in the heart of the FESTEN family intrigue. Organized in the framework of the 60th anniversary of the Smurfs, The Smurf Experience is a breath-taking plunge into the magical world of the little blue characters. 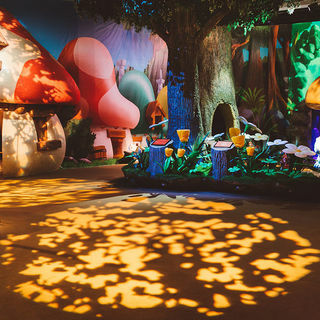 Thanks to a larger-than-life setting and live performances spread over 1500 square meters, visitors become “as tall as 3 apples”, which is the ideal height to live as a real Smurf and to discover their way of life and customs. But the wizard, Gargamel, is creating an evil machine that is threatening the world of the Smurfs. Visitors are invited to set out on an adventure and to help the Smurfs bring peace and quiet back to their village. Cross a waterfall using video mapping, escape from the cage where Gargamel has imprisoned you and hitch a ride on the stork’s back for an unforgettable virtual reality experience. The Smurf Experience is also a commitment to promoting sustainable development as it presents an educational path illustrated by the 17 sustainable development goals defined by the United Nations. The Festival UP! International Biennale is the most important event at the Espace Catastrophe. 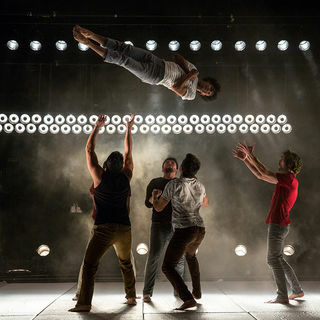 It gives expression to new circus forms in the heart of the Capital, with a demanding and diverse Belgian and international programme featuring a surprising range of circus arts. The 12 days of the Festival UP! take place throughout Brussels, in halls, under a circus tent and in public spaces. The 2018 event brought together 13 cultural partners for 45 performances, in front of 12,500 enthusiastic spectators. Two exceptional meetings further enhanced this event, namely the opening of FocusCircus with an evening event at BOZAR and, after three sessions at La Villette in Paris, Fresh Circus#4, a seminar for the development of Circus Arts, which attracted around 400 professionals from 34 countries. The Festival UP! is a showcase for modern circus arts and is one of the key events for the contemporary circus. Since July 2017, Around the World in 183 dishes has invited the curious, citizens of Brussels and elsewhere, to explore the mosaic of cultures that make up Brussels, the most cosmopolitan city in Europe. Initially designed as a project to combat food waste, it is now an inter-cultural meeting place based around cuisine and arts. 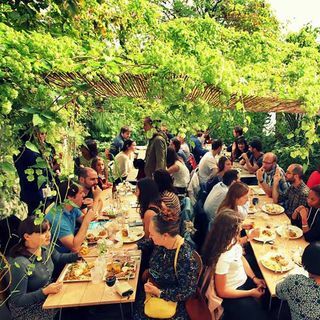 Every month two major events - brunch and a cultural evening - showcase one of the 183 nationalities found in Brussels. This is a stationary journey during which a community tells and shares the story of its country and the reasons for its arrival in Belgium. Around the World has already stopped off in 23 countries. Each monthly meeting starts with the initiative of one person who becomes a chef and ambassador for their country over the course of a weekend. Brunch is cooked using unsold foodstuffs collected by volunteers every evening of the week by bike from sustainable partners (organic supermarket and fine bakery) and thanks to a team of 45 volunteers. KANAL - Centre Pompidou, the future Museum of Modern and Contemporary Art, is located in the 35,000m² of the former Citroën garage in Brussels. 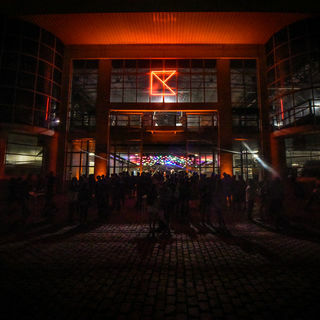 Pending the start of renovation works, which are scheduled to end in 2022-2023, KANAL opened its doors on 5 May for a 13-month preview. In collaboration with the Centre Pompidou, the public will be able to discover this mythical building through several exhibitions, large installations, ten new creations by Brussels artists and a programme of live shows. Harmon House was finally able to open its doors on 1 October 2018 after two years of renovation work. 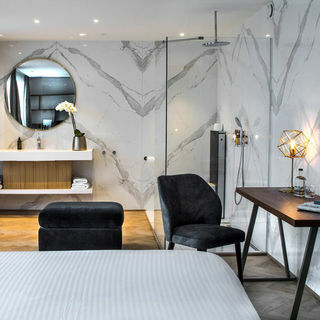 The work renovated and extended the 19th century mansion on the Chaussée de Charleroi in Saint-Gilles and turned it into a four-star boutique hotel. The aim was to breathe new life into this magnificent building, which had been left derelict. A great deal of work was carried out in order to do this, including the restoration of all the internal and façade mouldings and the addition of two additional floors on the main building. The building also now has a veranda that can be opened 75%, as well as welcoming contemporary decor. An energy optimisation system has also been installed. Bourse station, located in the centre of Brussels, the Belgian and European capital, and close to a number of centres of interest such as the Grand Place, Manneken Pis, the AB and the Beursschouwburg, needed renovation to bring it in line with the new Brussels urban dynamic. 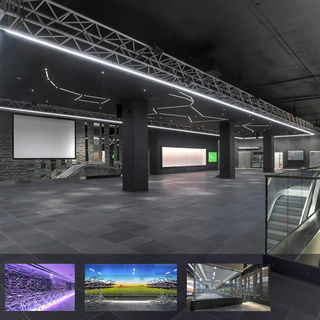 The renovation project for Bourse pre-metro station transcended the notion of station, by pushing the new urban activities of an intermodal station to their limit: pre-metro (tram), bicycle parking, bicycle point and workshop and a presentation space for cultural diversity, called "Qartier". This renovation was based on a trailblazing architectural programme that was translated into original spatial research and a great sense of detail in both the materials used and the equipment fitted, offering an authentic walk from the city centre for Brussels residents and visitors alike. René Magritte and the Atomium, two monuments of Belgian heritage, projected visitors into an experience that required all the senses and was suitable for all ages. The Atomium paid a unique tribute to René Magritte, the icon of Belgian surrealism famous around the world, fifty years after his death. The Atomium invited visitors to discover this exceptional exhibition from 21 September 2017 to 9 September 2018. Some of his most striking works came to life. 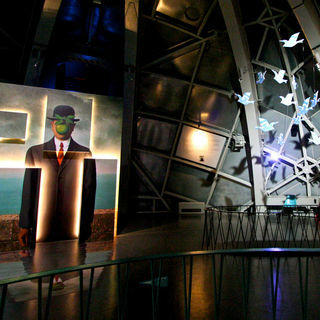 Transformed into decor and unveiled, they allowed visitors to experience the surrealist world of René Magritte. This exhibition on the masterpieces of René Magritte allowed visitors to experience, interpret and plunge into the surrealist world of the greatest Belgian artist, uncover the message hidden behind the works of art and discover the exceptional decors. René Magritte and the Atomium, two icons of Belgian heritage. Foyer vzw is an integration centre and focuses on projects for and in collaboration with immigrant communities in Brussels. These families are pretty much multilingual by definition and projects based on a multilingual upbringing are therefore one of the key topics. The focus lies on empowering the families, improving their mother tongue and learning the integration language. In a two-year European project led by Foyer, the specific focus lay on multilingualism and how this is experienced within families. A digital tool was developed that can be used to reinforce the language environment and in situations where language choices have a negative impact on welfare or opportunities for language learning. Partners from England, Italy and Lithuania were all involved in the project. 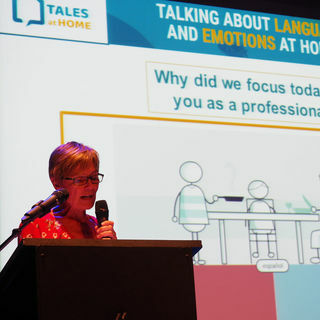 The outcome, after two years of work, was a conference and expert meeting on 8 and 9 May 2018 with the title: ‘Talking about Language and EmotionS at home. A project aimed at empowering multilingual families.’ 130 people attended the conference, 1/3 of whom came from abroad: experts in the field of multilingualism and international participants connected with the project.